It is that time of the year again and Pakistanis, who were deprived of cricket after the momentous Champions Trophy triumph earlier this year, will see their heroes in the National T20 Cup 2017. The Cup will start from 25th August and end on 10th September. 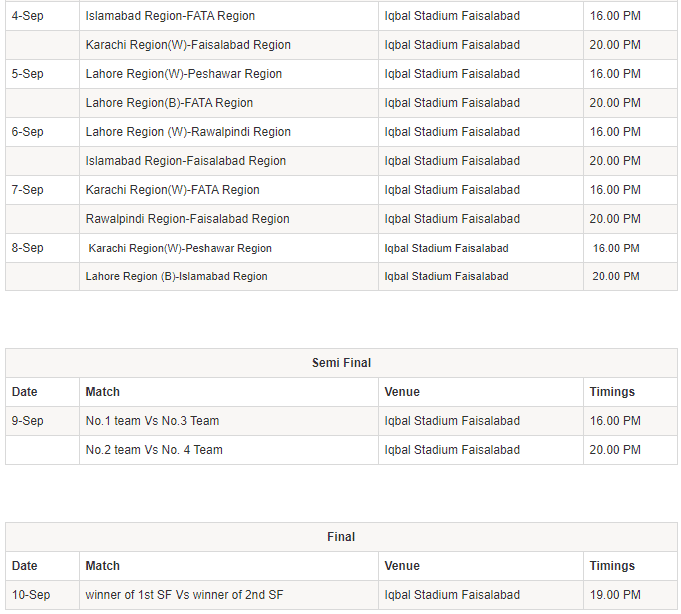 The matches will be played at two venues including Multan and Faisalabad. 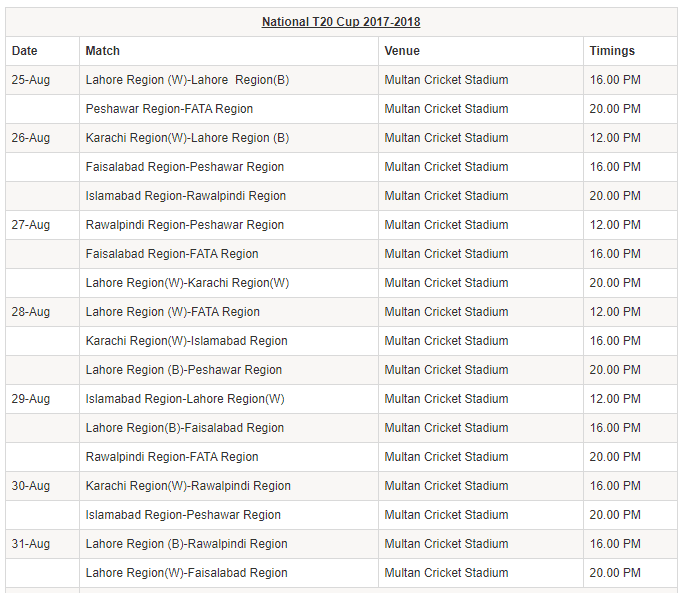 Matches from 25 to 31 August will be played at Multan International Cricket Stadium while the remaining matches will be hosted by Iqbal Stadium Faisalabad from 04 to 10 September. Big names like Misbah-ul-Haq, Shoaib Malik, Hasan Ali, Imad Waseem, Muhammad Hafeez, Babar Azam, Fakhar Zaman etc. will be seen playing the tournament. Players who’re currently busy in England’s county cricket – including Muhammad Amir, Sarfaraz Ahmed, Junaid Khan etc. – will be heading back home for the National Cup. No matches will be played during the Eid holidays. 8 teams including Karachi Whites, Lahore Whites, Lahore Blues, Islamabad, FATA, Rawalpindi, Peshawar, and Faisalabad will be participating in this year’s event. All the teams picked their squads from a list of 150 cricketers from all over the country. The players were selected by the respective regional head, selector, captain, and coach. A total of 31 matches will be played with each team playing 7 matches. Top 4 teams will qualify for the semi-finals which will be held on September 9, 2017, at Iqbal Stadium. The final will be held at the same venue on September 10, 2017. Why karachi and lahore both’s two team participating. Where are the team of otger cities, Like Hyderabad, abbotabbad, and 5 or more time champion Sialkot.